Once you receive the e-mail, please click the link(s) and download your product(s) as soon as possible. The link(s) will expire after 30 days. If you are unable to download your products during that time, please contact us and we will assist you. If you purchase the product that includes ALL of the tracks from the CD, the individual mp3 files will be zipped together into one file. You will need an unZIP program (such as WinZip, Stuffit, or PKZip) on your computer to separate the zipped files. Once you have downloaded the mp3s and saved them on your computer, you can play them on your computer using any mp3 player of your choice (i.e. Quicktime, iTunes, Windows Media Player, Real Player, etc. ), and/or upload them to your iPod or other mp3 player. You may also burn them to a CD for your own personal use. 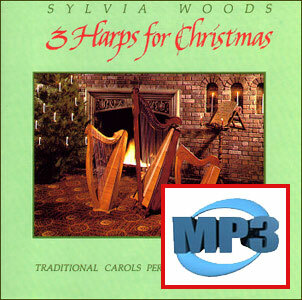 These products are mp3 audio track downloads of music from Three Harps for Christmas Volume 1 CD by Sylvia Woods. Recorded by world-renowned harpist Sylvia Woods these lovely Christmas carols are performed on three special harps: a nylon-strung Neo-Celtic harp, a wire-strung ancient Celtic harp, and a Triple-strung harp. Each carol is performed by Sylvia on 1, 2, or 3 harps, with no other accompaniment. Volume 1 contains 28 traditional carols. Some are well-loved, others are lesser known. Save money by ordering all of the downloads together for $9.95. The individual tracks will be zipped together in one file. For more information about how our mp3 downloads work, click on the "Download Information" bar above.